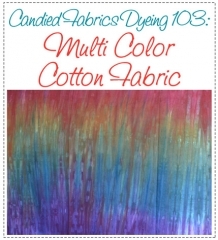 In Dyeing 103: Multicolor Cotton I will teach you how to dye truly beautiful pieces of multicolor cotton fabric. We will cover both exploring color theory to create new multicolor fabrics and I will share the “secret recipes” for 20 of my most favorite multicolor palettes. I’ve spent over 16 years perfecting my low water immersion dyeing techniques to create stunning pieces of multicolor fabric…and although each piece is truly one-of-a-kind, my methods allow me to mix the same colors over and over again, and I can manipulate the fabric in a certain manner and predict what it’s going to look like with accuracy. 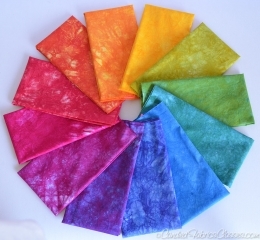 Now, I am anxious to share these methods with you so you too can create glorious, multicolor fabrics with intention! This class is packed with details! In the 10 sessions there are over 10 hours of video and 126 pages of downloadable PDF’s, along with several helpful spreadsheets. Because access to my classes never expire, you are welcome to take your time exploring color relationships while dyeing lots of incredible fabric. We begin by covering what you’ll need to complete everything in this course. The few specialized supplies needed are easily available to order online and the bulk of what you will use are easily purchased locally, or better yet, scavenged from your recycling bin (and perhaps those of your friends as well!). We will also cover how to find a place to do your dyeing safely and how to set up your workspace. I also cover the basic techniques you’ll be using throughout the class in this session. Dyeing a color wheel allows you to expand your knowledge of color theory, and stretch your understanding of color influence. I take you through this process and supply you with the measurements to make color wheels with both my preferred sets of primary colors. You are also welcome to create a color wheel with your preferred primaries as well, I’m here to help you with that! I teach you 5 completely different LWI techniques that span the gamut of control over the outcome; from lots of control over where the colors lay down and mingle to hardly any control at all. Have you always wondered what these were? In this session we’ll learn how to pick 3 colors around the color wheel and make them work. Finally, we’ll wrap up all we’ve learned and figure out where to go next in our explorations! I will use a combination of written worksheets, templates, step-by-step directions with lots of pictures, and videos of steps that could be tricky. Dyeing 103 has over 10 hours of video and 126 pages of downloadable PDF’s; the class is just about complete! Each session will have a Question and Answer forum associated with it – I will respond to any question you have within 24 hours, and both these questions and answers will be available for other registered students to view. The beauty of an online course is that if several people are having the some difficulty with a particular step, I will just create additional content to add to the session to clarify any confusion. You’ve seen gorgeous multicolor fabrics and wished you knew how to make them. You end each dyeing session hoping that the fabrics will have the colors that you were hoping for. You’re not sure if an online class format will work for you; everything you paid for is immediately available to you, there’s no way to issue refunds if you find this format isn’t for you. Make sure to look at this checklist and my sample online class session before committing to this class. 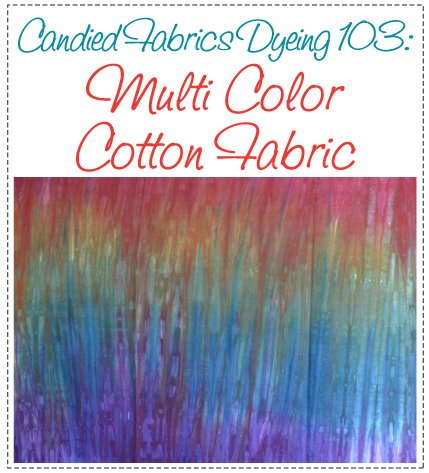 Also, I have a much smaller, simpler online class as an introduction to hand dyed fabrics you may want to look into. Yes! In this class we focus on creating multicolor fabrics. We will be using spreadsheets to calculate the amounts of dye we will be using, this will come easier to people who have taken Dyeing 101: Controlling Color, but I’ll cover this amply in this class. If you’d like to avoid using a scale, I provide you with information on how to achieve results that are close to mine without the precise measuring we learn in Dyeing 101. I covered over 115 different variations on how to dye fabric in Dyeing 102: Controlling Texture, so you’ll have lots more options on how to dye your multicolor fabrics than the 5 that I cover in this class, but those 5 are more than enough to use when we’re focussing on. If you’ve never dyed fabric before, you may want to start with my class designed for true beginners, Dyeing 100: Intro to Dyeing with Fiber Reactive Dyes. It’s very basic and takes you through all the basics of hand dyeing with an emphasis on simplicity. However, if what you really want to do is dye multicolor cotton fabric, jumping in right here is totally doable! This content for this class is complete, you can start at any time. It is self-paced, with no expiration date (because I know all about how life can take unexpected turns). Dyeing does require a fair amount of supplies, but the vast majority of them are easily and cheaply obtainable, and can be satisfied a number of different ways. In the class I explain why and how to obtain these supplies, and suggest options where appropriate and point out when substitutions would not work. Here is a simple checklist for you to quickly see all the supplies for the entire course. Please feel free to email me (Candy@CandiedFabrics.com) if you have any particular questions about any of these.